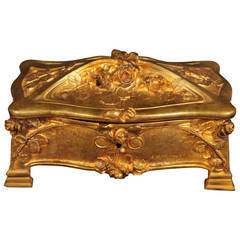 The top, front, sides and back are beautifully cast in gilt brass and feature panels with image of angels. The inner side is covered with cedar wood. Nice original patina. Signed Good condition. Nice original patina. looks simply stunning. Late 19th century wooden oak box, with inlay works Austria, circa 1890. The piece is in good condition and a real beauty! Circa 1900 Origin: Paris Signed: A. MARIONETT Dimensions: H: 3.5" W: 9 " Open: 10"
Very finely detailed ormolu bronze box frame with five Pietra Dura Stone marquetry panels. Interior has original silk lining. Not marked and attributed to Pietra Dura.